I've been meaning to get going on covering my most recent visit to Bon in Texas, but got sidetracked by Too Many Projects and other busy time-stealing life necessities. Excuses out of the way, I will now address one thing that happened when I was away. No, not putting it in caps. I tried not to make a big deal of it, as I don't actually celebrate birthdays, and people are fond of telling me I don't look 40 (keep that coming, I love you), but internally I was screaming in anticipation of what I've always viewed as Official Middle Age-dom. For a good portion of my life, I've juxtaposed between feeling old and young, and feeling frankly confused. Many of my close friends have been younger than me, and though I never put myself in the position of being the Mother of any group, I find that I'm usually the one who feels achy first, who runs out of steam first, and that made me feel old, even in my mid-twenties. The Tea Queen persona could have aged me, but tea culture has gained a younger following in recent decades, so I'm not bothered there. Also, in my 30s I started to read up on Introversion vs. Extroversion, and realized that being worn out from hanging out in big groups had little to do with age, and I was not alone in needing to be alone more. The physical aches, well, I don't know. This year the back issues and problematic knee didn't help me feel like a spring chicken, but there's a part of me, mentally, that feels entirely youthful. I still have the "when I grow up" thoughts, and I never grew out of wearing silly hair clips, and other items that I was supposed to move past long ago. I want to be respected for how far I've come, but I don't want to be "past it", either. These concerns asserted themselves into my waking and sleeping thoughts, and I was only too happy to be going out of town, away from reality, when I left my 30s behind. On a full but comfortable Delta flight, I was pleased to find my route finally had in-flight entertainment. Though I welcome any excuse to catch up on reading, I will always prefer passing the hours on a plane with a movie or two. I found a documentary that proved to be perfect timing for my pre-mid-life crisis. The image of Iris Apfel lingered in my sub-conscious, but I'd never paused to consider her, or who she was, until Albert Maysles brought her to life in such a vivid and loving way. She's her own woman, without steeping on others' toes or being obnoxious about it. Not that she won't express an opinion, but she won't jam it down your throat. 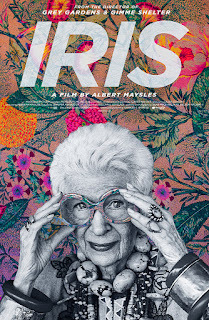 She has the most unique but enjoyable to see style I've ever seen, she's a refreshing kind of New Yorker, she's developed a massive adoration in recent years through museum exhibitions and media coverage, she's nonstop, and at the time of writing, is 95 years old. I'm not saying Iris will be running marathons or climbing Mount Everest any time soon, but she is living life, using whatever time is given to her, and she's a pleasure to watch. Bonus: she grew up in Astoria, Queens. For this alone I'd like to meet her, to ask what it was like in the 30s? Does this mean I want to be exactly like Iris? No, though I'd love to possess her haggling skills. I simply like her approach - remembering where she came from, always moving forward, taking delight in childish things - basically spending her later years playing dress-up, and having worked hard her entire life, earning the right to play. Though I'm still not looking forward to aging, and I don't know anyone who does, watching someone who hasn't given up makes it a little easier to cope with a new mature-sounding decade. And I know some occasions cause for toning down in the realm of apparel, but I love the idea that one never has to truly grow out of who they are. I'm not taking off my silly hair bow! So, though I still occasionally say to myself: "What?! Forty?! ", my anticipatory gloom faded somewhat during that 4 hour flight, and I had a wonderful time. More on that following. Finally, I recognize that I hardly covered what was in the documentary, but that's because you should see it for yourself! Only spoiler is that at the very end, there mention of making tea. Full circle, my friends. Pair with a colorful fruity blend.